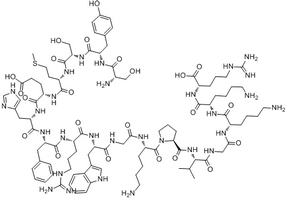 A peptide is a molecule consisting of two or more amino acids. The covalent chemical bonds between amino acids are formed when the carboxyl group of one amino acid reacts with the amino group of another amino acid to form a peptide amide bond. 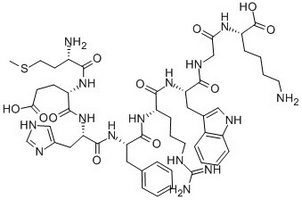 Peptides may be naturally biologically occurring short chains of amino acid monomers linked by peptide bonds or they may be synthetically manufactured. Researchers often ask, what is the difference between a peptide and a protein? After all, proteins are composed of chains of amino acids too. 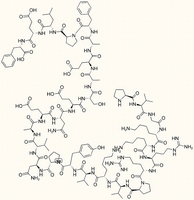 Peptides by definition are smaller than proteins and are often thought as small proteins. Conventionally speaking, molecules small enough to be synthesized from their constituent amino acids are called peptides rather than proteins. 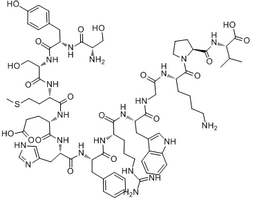 Both synthetically manufactured and naturally occurring peptides are common research tools in most laboratories today. Many of today's commercially manufactured antibodies are generated from synthetic peptide immunogens. A convenient feature of this technology is that the peptide immunogen can be used as a control or blocking peptide in different applications. For example, if the antibody is being used in western blot then the antibody can be pre-incubated with the immunogen peptide to block or partially the ability of the antibody to bind to the target protein because it is bound to the peptide immunogen. MyBioSource offers a plethora of pairs of antibodies and their respective peptide immunogens. 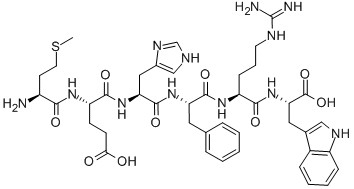 Blocking peptides are available for mouse, rabbit, as well as goat peptide-derived antibodies and are listed on the antibody data sheet when available. Theoretically, the corresponding peptide will block or partially block the ability of the antibody to bind to its target protein in any application that the antibody is being used for. This may include western blot analysis, immunohistochemistry, immunoprecipitation or even functional applications if the antibody has a functional application such as neutralization or activation. The actual utility of any given blocking or control peptide is typically empirically determined by the researcher for their individual model system. The use of blocking peptides in research studies is often looked upon favorably by reviewers of journals because blocking peptides serve as a type of specificity control for the corresponding antibody and can aid in data interpretation. 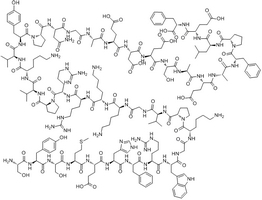 Peptide hormones are a good example of naturally biologically occurring peptides. 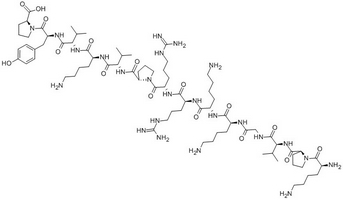 Peptide hormones like other naturally occurring peptides are synthesized within cells from amino acids. The amino acid sequence is, of course, specified by a specific mRNA transcript which is synthesized from the respective DNA template inside of the cell nucleus. Neurotransmitters are another good example of a natural biological substance that may exist as a peptide, in this case they are referred to as neuropeptides. 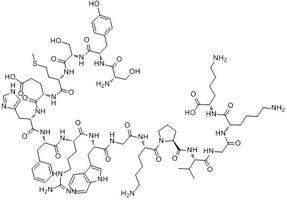 MyBioSource also offers custom peptide synthesis. 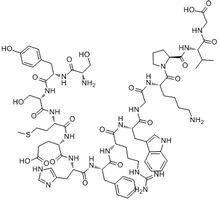 Peptides will be synthesized according to your specifications including purity requirements. Please click here to submit your custom Peptide request to our technical department. For normal ordering, please order directly from MyBioSource.com or fax your order to 1.858.633.0166 or contact our sales professionals at sales@mybiosource.com. Displaying 151 to 200 (of 868 products)	order by Products Name. Highly Purified~95%. Purified by HPLC. Highly Purified~90%. Purified by HPLC. Highly Purified>=95%. Purified by HPLC.